The Early On Michigan Foundation is proud to offer products developed in Michigan to our out-of-state neighbors and international friends. 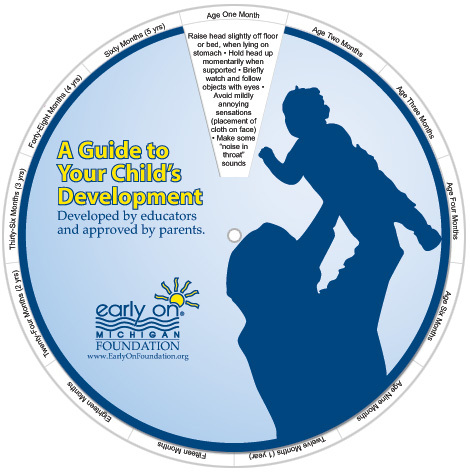 The Developmental Wheel a popular outreach and educational tool for child care providers, hospitals, and human service agencies. Proceeds from sales of the developmental wheel, A Guide to Your Child's Development, go to strengthening Early On programs in Michigan. A Guide to Your Child's Development: Developed by educators and approved by parents. *for orders in excess of 100 wheels, please call 1-517-668-0185 for a quote on shipping/handling.